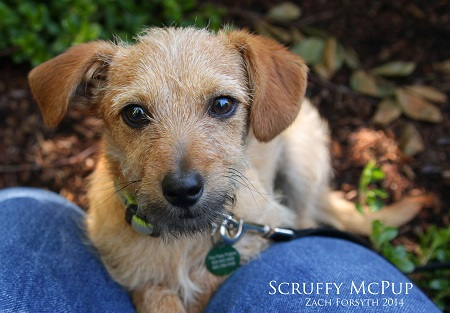 Hi guys I’m Scruffy Mcpup, and I’m ready to find my forever home! I’m a super cuddly little guy just trying to find my way around this fun new place. In my shyer days I became I bit of a bookworm and discovered just how much I loooove learning.. Which is perfect because I will require puppy classes with my adoption! I’m sure to graduate top of my class. I am a 4 1/2 month old Terrier/Dachshund mix, just 6 pounds. I come neutered, microchipped, up to date on all vaccines and I am GREAT with other dogs–kitties too! My adoption fee is $300. Do I sound like your kinda guy? Go ahead and fill out an application at pixieproject.org so we can finally meet! !